Ripple price recovered recently, but it failed to break the $0.3120 resistance against the US dollar.The price is slowly declining and it is currently trading well below the $0.3100 level.There is a crucial bearish trend line formed with resistance at $0.3065 on the hourly chart of the XRP/USD pair (data source from Kraken).The pair might continue to slide and it could revisit the $0.3020 support level in the near term.Ripple price is currently under pressure against the US Dollar and bitcoin. XRP/USD is facing a strong resistance near $0.3070 and it may extend its decline towards $0.3020.Ripple Price AnalysisAfter testing the $0.3000 support, ripple price started a short term rebound against the US Dollar. The XRP/USD pair traded above the $0.3050 and $0.3080 resistance levels. The price even traded above the $0.3100 level, but it faced a strong resistance near the $0.3120 level. Besides, the price even failed to test the $0.3120 level and the 100 hourly simple moving average. A high was formed at $0.3113 and later the price started a downside move.It traded below the $0.3080 and $0.3060 support levels. A low was formed at $0.3031 and the price is currently correcting higher. It is trading above the 23.6% Fib retracement level of the last decline from the $0.3113 high to $0.3031 low. However, the previous support near the $0.3060 level is acting as a resistance. There is also a crucial bearish trend line formed with resistance at $0.3065 on the hourly chart of the XRP/USD pair.Above the trend line, the next resistance is near the $0.3080 level. It coincides with the 61.8% Fib retracement level of the last decline from the $0.3113 high to $0.3031 low. However, the main resistance is near the $0.3100 level and the 100 hourly SMA. Therefore, even if the price breaks the $0.3065 resistance, it is likely to struggle near $0.3080 or $0.3100. On the downside, an immediate support is near the $0.3030 level, below which the price may revisit the $0.3020 support level. Looking at the chart, ripple price is clearly trading near important resistances near $0.3060 and $0.3070. There may be a short term upside break, but the price remains in a bearish zone as long as it is below $0.3100. On the downside, if there is a break below the $0.3020 support, there could be heavy losses towards $0.3000 or $0.2920.Technical IndicatorsHourly MACD – The MACD for XRP/USD is slightly placed in the bullish zone.Hourly RSI (Relative Strength Index) – The RSI for XRP/USD is currently just above the 40 level.Major Support Levels – $0.3030, $0.3020 and $0.3000.Major Resistance Levels – $0.3065, $0.3080 and $0.3100. Bitcoin has been experiencing a quiet weekend trading session and is currently firmly in the middle of its long-established trading range between $4,000 and $4,100. It is unclear how long this range will persist, but historically BTC has experienced fairly significant price swings after long bouts of sideways trading.Now, analysts seem to concur that Bitcoin is posed to make a large upwards swing towards $5,500 in the near future, but it is important to note that the possibility of further downside still remains.Bitcoin (BTC) Caught in Persisting Trading RangeAt the time of writing, Bitcoin is trading down marginally at its current price of $4,020. Over the past several days, BTC’s volatility has been declining as its trading range grows tighter.Although the upper bound of BTC’s current trading range will most certainly act as a level of resistance in the near-future, the key level that analysts and traders alike are closely watching to see how Bitcoin responds to is $4,200, which is where the crypto faced strong resistance and spiraled downwards from late last month.Crypto Krillin, a cryptocurrency analyst on Twitter, recent discussed where he sees Bitcoin heading next, importantly noting that he believes the crypto will make an upwards swing towards $5,500 next, but further added that a downside target of $3,000 is still a possibility.“The moment of truth for Bitcoin is very near. We fly straight through the cloud to 5500, or we visit 3000. I’m leaning bullish,” he explained in a recent tweet.$BTC“Confluence”The moment of truth for Bitcoin is very near. We fly straight through the cloud to 5500, or we visit 3000. I’m leaning bullish. pic.twitter.com/15a9QWXpKK— Crypto Krillin ॐ (@LSDinmycoffee) March 23, 2019$5,500 Becoming an Important Level For BitcoinCrypto Krillin is not alone in his belief that Bitcoin’s upside target currently exists around $5,500.Yesterday, Galaxy, another popular cryptocurrency analyst on Twitter, explained to his nearly 50k followers that BTC is currently nearing the end of an ascending triangle formation, which means that the crypto is, statistically speaking, likely to make a large upwards price swing towards $5,500 in the next month or two.“According to Bulkowski’s study, more than 60% of ascending triangles with declining volume end up breaking upwards… with an average price rise of 35%. That gives us a target of $5500 BTC once the breakout is confirmed,” he noted.According to Bulkowski’s study, more than 60% of ascending triangles with declining volume end up breaking upwardswith an average price rise of 35%That gives us a target of $5500 BTC once the breakout is confirmed. 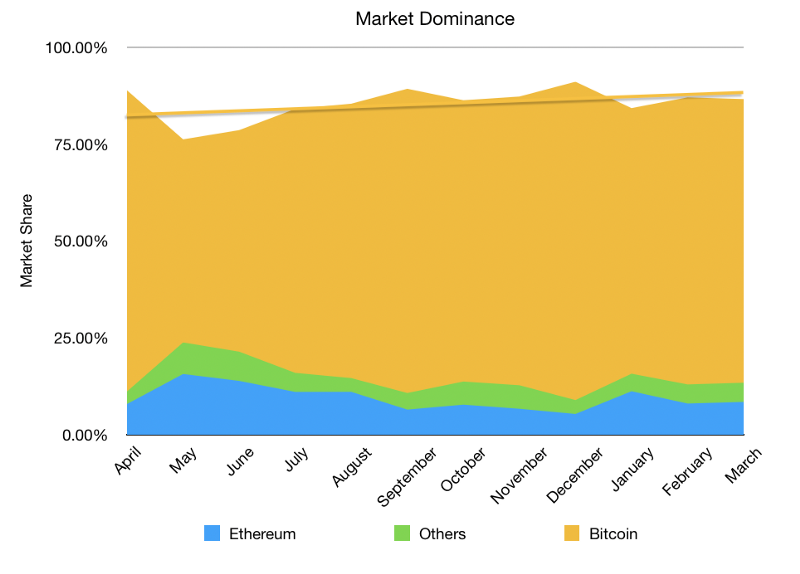 $BTC pic.twitter.com/dThMCtNZDX— Galaxy (@galaxyBTC) March 23, 2019As the new week starts and trading volume begins to ramp up, the crypto markets will gain greater insight into just how strong Bitcoin’s current trading range is, and as to where it will head next.Featured image from Shutterstock.